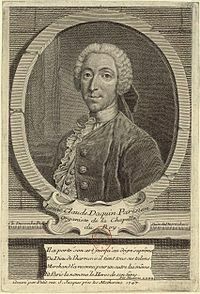 Louis-Claude Daquin (born Paris, 4 July 1694; died Paris 15 June 1772) was a French composer. He was writing in the last part of the Baroque period and the early part of the Classical music period. He was a virtuoso organist and harpsichordist. He wrote a lot of excellent music for organ and for harpsichord. His most popular piece is called Le Coucou (The Cuckoo). Louis-Claude Daquin Facts for Kids. Kiddle Encyclopedia.